Vauxhall Astra GTC from the inside | What Car? The GTC is a sporty, three-door version of the latest Astra that will compete with four-seater coupes such as the Volkswagen Scirocco. While it's clearly a member of the Astra family, the GTC is largely bespoke and looks a lot sleeker than the five-door. On the outside, only the door handles and aerial are shared. The GTC will be sold on the Continent as an Opel, but the UK is expected to be the biggest market, accounting for around 40% of sales. As a result, much of the chassis development work was carried out on UK roads. So far, we've experienced the GTC from the passenger's seat only. First impressions are that there was little body lean in bends, and the ride seemed nicely controlled. The 163bhp 2.0-litre diesel engine in our test car was less impressive, sounding a bit grumbly. The other engines available at launch are all turbocharged petrols: 118bhp and 138bhp 1.4s and a 178bhp 1.6. A flagship VXR model will join the line-up next year; this is expected to have around 300bhp, so should be a real threat to our reigning Hot Hatch of the Year, the Megane Renaultsport 250 Cup. All Astra GTCs come with Vauxhall's Hiperstrut (High Performance Strut) front suspension system, which is designed to improve traction and reduce interference to the steering under hard acceleration. Vauxhall has also developed a unique steering set-up for UK cars because it felt the standard Opel one didnt provide enough feedback. An adaptive damping system will be available as an option. Despite its sleek, coupe-like shape, the GTC has space for four adults clever styling means the roofline looks lower than it actually is. The boot (which is accessed by pressing the Vauxhall badge on the tailgate) is the same size as the five-door Astra's, at 370 litres. By contrast, a Scirocco gives you just 292 litres of luggage space. The GTC we spent time in was a pre-production model, so some of the cabin plastics weren't the finished article. Production versions should match the five-door Astra for quality. The design of the dashboard is unchanged, which means it looks classy, but is covered in buttons and quite difficult to navigate. Rear vision is limited due to thick rear pillars. We'll need to get behind the wheel of the GTC before we can answer this question, but the early signs are promising: it looks great and should be better to drive than the five-door Astra. The GTC is also competitively priced, undercutting equivalent Sciroccos by around 1000. Standard equipment includes 18-inch alloys or bigger, a DAB radio and a USB socket. Every engine bar the 1.6 petrol comes with an engine stop-start system. CO2 emissions range from 129g/km to 164g/km. 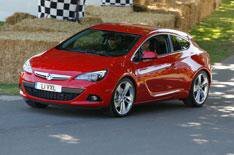 You can read our first drive of the Astra GTC on October 17.